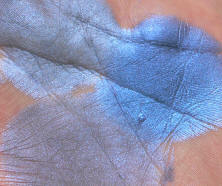 The colored micas that we sell can be used "as-is" as eyeshadow. However, you can save money and actually improve the adhesion and feel of the colored mica by extending it with a filler. The cheapest filler that we sell is Kaolin Clay. At $6 per pound (as of this post), that makes it a super-inexpensive filler. It also adds adhesion to the colored mica. Other fillers which we recommend include: magnesium stearate, boron nitride, talc, silica microspheres, ronasphere, authentic silk powder and bismuth oxychloide. Any time you mix a colored mica with a filler, you will change the look of the powder. Typically, the additives will make the colored mica less intense in hue and sometimes less shimmery. This can be a good thing, if it is what you want. You have to experiment. For example, in the photo above, the color to the far right which is deepest in hue is our Deep Blue mica "as is". Below and to the left is the color mixed with equal amounts of our Authentic Silk Powder. You can see it becomes somewhat more matte, more translucent, and duller. Above and to the left is the color mixed with equal amounts of our Boron Nitride. It retains more of the shimmer and opacity, but it is also paler. If you used less filler (in our examples it is equal parts filler to colored mica) the result would be a darker, more vibrant hue. You just have to experiment! These machines damage the shine and brilliance of colored mica. Colored mica is specially manufacturered and that kind of blending (called "high shear") breaks the powder up and makes it duller. Since gentle mushing between your fingers is sufficient, we suggest it!